Driving slowly into the heights of the Andean highlands, you will find yourself surrounded by snow-capped peaks scraping the heavens. In the distance, you’ll spot small dots of villages huddled vicariously along the vast Peruvian mountainside. As you finally slow to a stop and step out of your vehicle, a mass of white will catch your eye: no, these are not clouds, they are a huge group of Alpacas, all gathered together for a special ceremonial blessing. It is here that your host Juan and his family will come to greet you with warm smiles and big hugs, and they will welcome you graciously into their village home. Dressed in traditional garb, Juan will tell you a little of his story before performing the special and intimate Alpaca blessing. Born and raised in the small village in the Peruvian mountains, Juan has dedicated his life to farming and caring for his family’s home and herds. 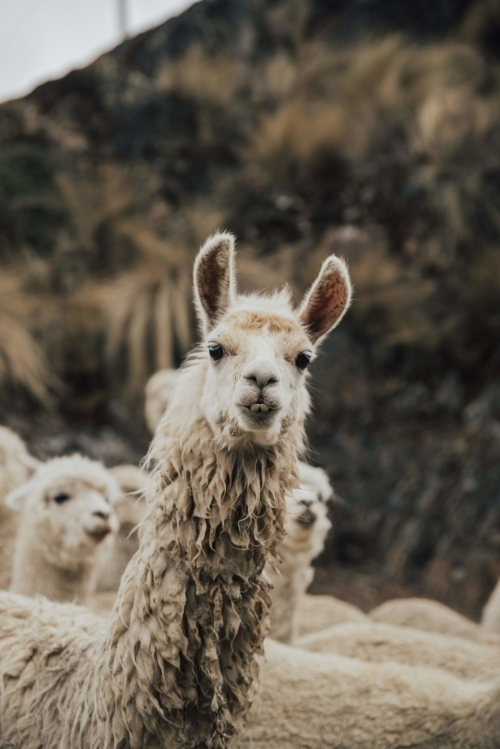 Because the conditions are so extreme at the top of the Andes mountains, only certain products can survive, namely potatoes, corn, and, of course, Alpacas. This is how they survive in the mountains. Alpacas are especially important to Juan and his whole village. So, they perform special ceremonies to continue to ask for blessings on the herds. First, all of the alpacas are gathered together, and the youngest are brought to the front of the herd. Cocoa leaves, incense, feathers, and other items are gathered up in a pouch and burned, and special water is thrown over the tops of the heard while the baby llamas are decorated with flowers & natural colors as prayers are spoken. 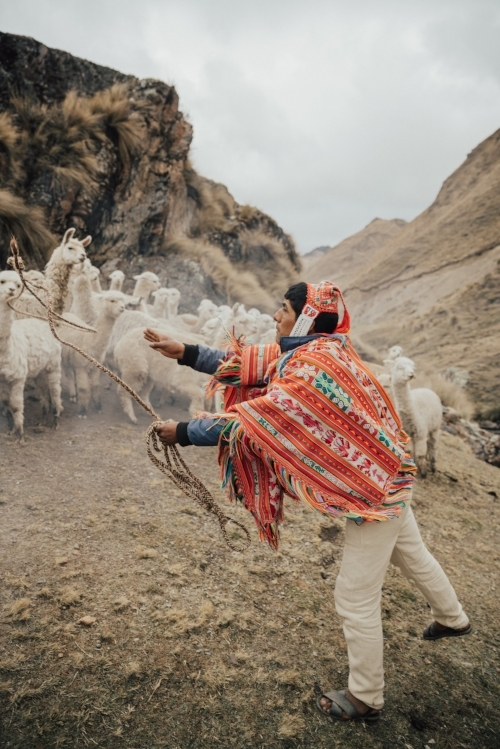 At the end of the ceremony, the people dance around the herd with flags and vibrant clothing until all the llamas are released back into the mountains. 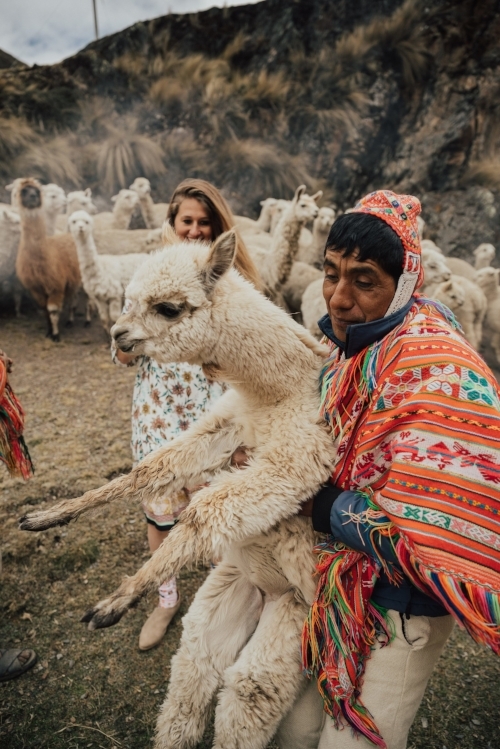 Who wants to join Juan and his family on the next Alpaca adventure in the Andes? Book a trip and join us in Peru! Last October, I had the pleasure of visiting Peru for the first time. I was able to interact with the locals, experience their cuisine, and explore the cities. During my stay, one of the most memorable things was the hospitality from the local people and their willingness to open their hearts to travelers. This life changing trip really inspired me to write about the amazing experiences that makes this destination one of my favorites. The South American country of Peru might be most famously known for Machu Picchu and the Amazon Rainforest, but don’t be fooled into thinking that these are the only things that Peru has to offer. Here are 10 additional sites you may want to seek out during your visit to Peru, and and check out this handy travel guide. Peru has one of the most diverse climates in the world, making it significantly more tricky to pack for. If you’re planning a trip here, you’ll most likely be exploring sites surrounding Cusco, here is our guide to help you prepare. Who doesn’t love a llama? These curly haired cuties are full of surprises — here are a few things that might surprise even you, you llama super-fan. Celebrated as Peru’s most famous hike, the classic Inca trek to Machu Picchu can be considered one of the world’s iconic trekking experiences. In 2007, Machu Picchu was voted one of the new seven wonders of the world. Peru a is popular designation in South America. This well-known country is home to Machu Picchu, the Inca Trail, and a section of the Amazon River. Peru is the third-largest country in South America! Peru is a well-known travel destination but do you know about their unique hotels? Peru is a huge country with so much more to offer beyond Machu Picchu, its best-known attraction. Here are some of Peru’s natural wonders that you won’t want to miss on your next visit to this beautiful country. Peru contains 84 of the 103 ecosystems in the world and 28 of the 32 climates, making it the most ecologically diverse country in the world. And while the country is certainly travel-friendly all year round, the various regions and climates make different times of the year ideal for travel. Read below to figure out the best time to plan your perfect trip to Peru! With its fresh ingredients and bursting flavors, Peruvian food has been climbing up the popularity charts over the past few years. Some restaurants have even consider the food a “trend.” Be sure to take advantage of all of these delicious dishes during your next trip to Peru! Many tourists flock to Peru’s most popular wonder, Machu Picchu. This is for good reason, as Machu Picchu is one of the most inspiring and beautiful sites in the world as well as one of the 7 Wonders of the World. However, much of the Northern regions of Peru go unexplored. If travelers only knew the many amazing sites left unseen, I’m sure they would want to add a week or two on to their Peru Expedition. Imagine taking a 10 hour flight, 3 hour drive, 1 hour train ride , 30 minute public bus, and a a 15 minute hike, you will find yourself at a place voted to be one of the New 7 Wonders of the World--Machu Picchu. While many people visit Machu Picchu, which don't get me wrong - is a spectacular site- they often miss exploring the beauty of the valleys & villages that surround it. Like visiting Juan, his family, and their 1000 alpacas. Hiking the Inca Trail to Machu Picchu is an experience unlike any other. With three routes to choose from, the trek takes you through the Andes Mountains to the gates of the famous ruins. This journey can be found on many travelers’ bucket lists, and while almost anyone can accomplish it, a lot of important preparation must be done. The expedition will test your physical and mental limits like never before, but the experience and the breathtaking views make it so worth it. Keep reading to learn our tips for hiking the Inca Trail! A couple weeks ago I went on the most incredible trip with Acanela, and what’s more I was allowed to bring my brother, Cameron, along for free! Together we discovered Peru, learning about their beautiful culture and taking countless photos. Almeurzo. That mid-afternoon meal where friends and family gather to take time to enjoy one another’s company. It’s not just lunch in Peru. It’s THE meal of the day. Everything comes to a halt for food, and then it’s naptime before heading back to work. Peru celebrates the afternoon like the Europeans celebrates the evening. The magic of a meal, however, is timeless. Nothing brings people together quite like food. It’s at the heart of so many cultures, and learning about the local cuisine is the perfect way to immerse yourself in a new environment. There are countless destinations across the globe that offer mouthwatering dishes and rich culinary diversity, but some countries reign supreme. Keep reading for the top culinary destinations around the world! I feel that sometimes we can get caught up only experiencing the “touristy” locations, but Acanela made sure to show us the real Cusco. We had the opportunity to travel with some INCREDIBLE Content Creators, Brands, and Influencers on our Tour of Peru! We had an AMAZING time as we immersed ourselves in Peru's BEAUTIFUL culture, cuisine, and landscapes. Peru offers breathtaking views and exciting adventures year-round, but depending on how you plan to spend your trip, some months are better for travelers than others. Different times of the year provide diverse scenery, opportunities, weather, and flora & fauna. In Peru, the year is split into two distinct seasons—wet and dry. While they correspond with winter and summer, you’ll find that distinguishing between wet and dry will be the easiest way for you to plan your ultimate Peruvian getaway. Machu Picchu is one of the top places to visit in of South America, followed very closely by the Galapagos Islands. A journey to Machu Picchu and the Galapagos Islands is a trip that every traveler should take once in their lives. So, when is the best time to visit Galapagos and Machu Picchu? Typically Spring (April-June) and Fall (Sep-Nov) is the best time to visit, as the weather is mild and pleasant in both countries. Don’t miss these 5 places to visit in Bolivia including: riding the cable-cars in La Paz, watching the sunrise over Lake Titicaca, hiking the Valley of the Moons, eating the street food in Copacabana, and taking the “Death Road” into the Bolivian Amazon. Bolivia is a hidden gem for adventure, amazing food, and beautiful photo locations - keep reading to hear more about my favorite places and favorite activities from my trip to Bolivia. It’s no secret that planning a wedding can quickly become overwhelming. Every decision feels more important than the last, from choosing the venue to the guest list to the flowers. But when you’re caught in the frenzy of planning, it’s important not to forget about what comes after the ceremony—the honeymoon. This decision making process is one you should cherish, as it’s where you’ll spend your first days as husband and wife. It’s your own personal paradise to unwind and soak it all in after the stress and craziness of wedding planning. It’s also the perfect opportunity to check off a bucket list vacation spot. For some, it may be hard to know where to start, but keep reading to find out our top destinations for honeymooners! What is a Llama Blessing Ceremony in Peru Really Like? While there are so many things to do and see in Peru, some of the most treasured experiences cannot be planned for. I'll never forget the time we were invited to participate in a Llama Blessing Ceremony (alpaca are commonly blessed, too) in one of the villages outside of Ollantaytambo, Sacred Valley, Peru. A thrilling new adventure awaits you at one of the top places to hike around the world! Whether you are a dedicated mountaineer or just looking to spend some time enjoying nature, each of these thrilling hikes will transport you to a world of wonder and leave you with a lasting sense of accomplishment. Experience rich cultures, breathtaking landscapes, and nature’s finest wildlife at one of these incredible destinations. Packing for an independent trekking excursion can be daunting at first, but it becomes well dialed with practice and experience. It’s often more expensive, but lightweight options are well worth their price tag. Here’s a list of the essentials to pack I would consider for a Peru trip if you plan to hike independently. If you take a guided tour, there are several items you won’t need.